If you are looking for an easy, but impressive side dish, look no further than this roasted delicata squash. 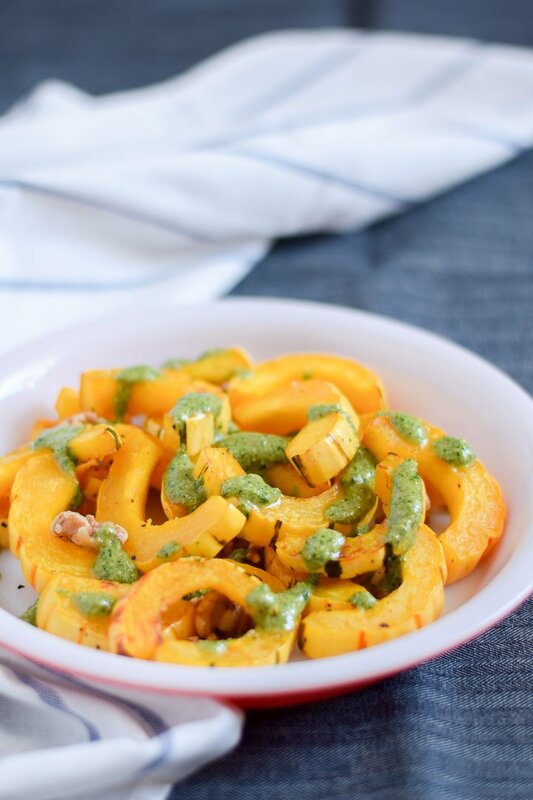 The sweet squash pairs perfectly with a fresh herb pesto giving you a healthy side that is perfect for a weeknight or a dinner party. I spent a lot of my childhood purporting not to like squash. Which seems ridiculous, because absolutely love it now. (I think it was a texture thing.) Now that I have wised up, I look forward to squash season every year. Through there are many ways to prepare winter squashes, my favorite method, hands down, is to roast them. The natural sugars in the squash caramelize while the flesh becomes super tender. Though I love the sweetness of roasted squash, I can’t help but crave some acidity and freshness to go with it. Enter the herb pesto. 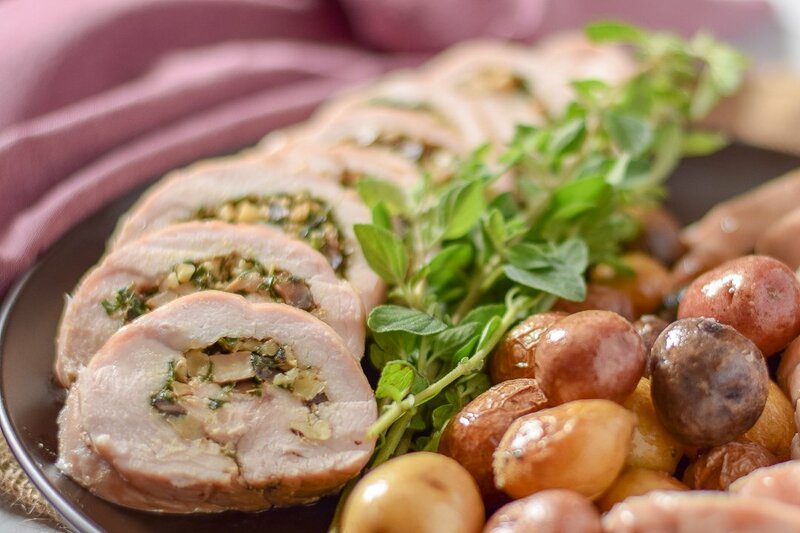 For this recipe, I swapped out the traditional basil and pine nuts for parsley and walnuts. They add a brightness and earthiness to the rich, roasted squash, making it perfectly balanced and a great side to any meal. 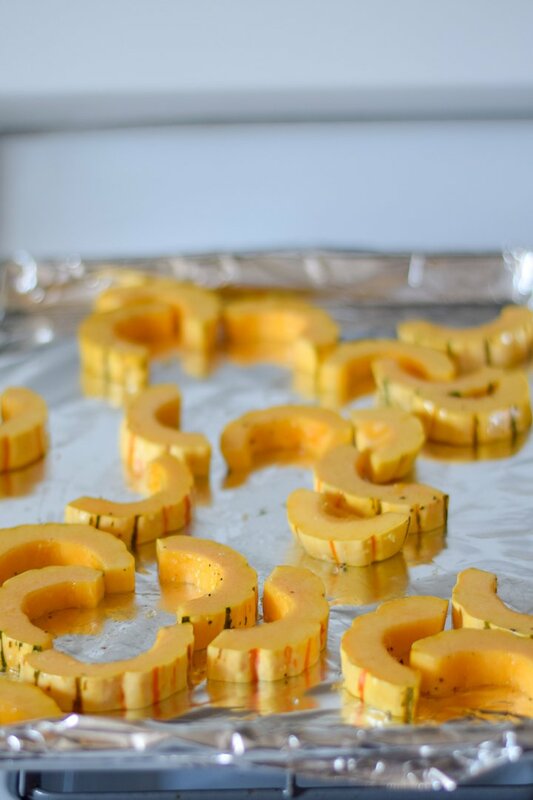 Delicata squash is the perfect fit for a recipe like this. The skin is very thin, so no peeling required! Just halve, scoop out the seeds, and slice into thick half moon shapes. If you are serving a large crowd, this recipe scales up easily – just double (or triple!) everything. Last but not least, walnuts add both flavor and texture to this roasted delicata squash dish. To bring out their best flavor, add the walnuts to the sheet pan for the last 3-4 minutes of roasting. 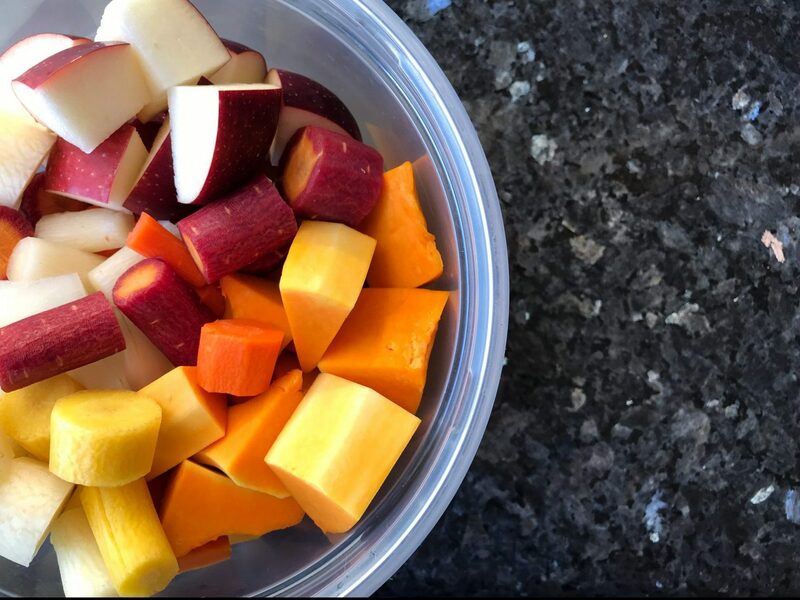 This will help bring out their natural oils and flavors and you won’t regret taking this extra step. Cut the squash in half lengthwise, then scoop out and discard the seeds. Cut into ¾” half moons. Drizzle the squash with 1 ½ Tbsp. of olive oil, and season with salt and pepper. Roast for 20-25 minutes, or until the squash is tender and easily pierced with a fork. 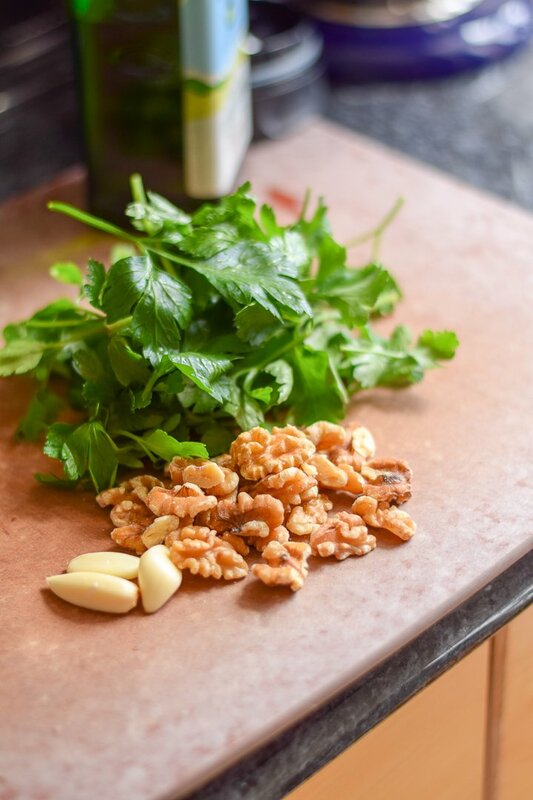 While the squash roasts, combine the parsley, garlic, white wine vinegar, and half the walnuts in a food processor. Pulse a few times, then add ¼ cup olive oil and blend until the mixture is smooth. Add up to two tablespoons of water, or until the pesto reaches a “drizzleable” consistency. 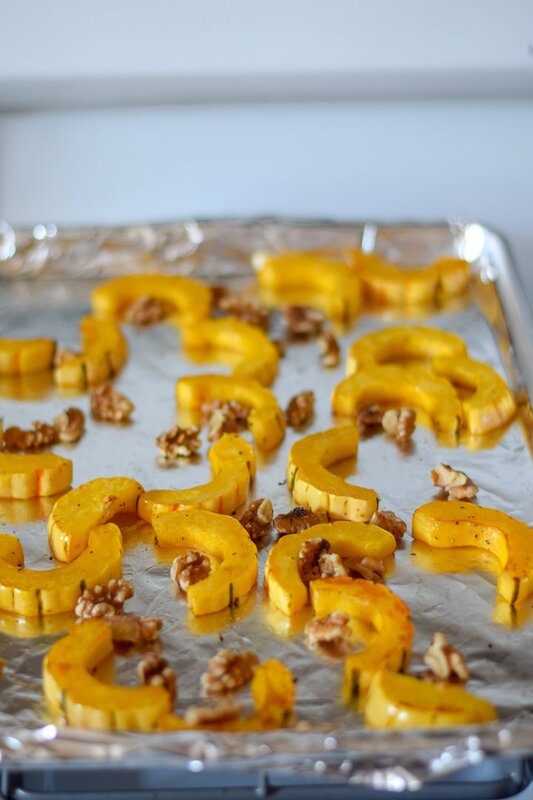 In the last 3-4 minutes of roasting the squash, add the remaining walnuts to the sheet pan. Remove from the oven and allow to cool slightly. 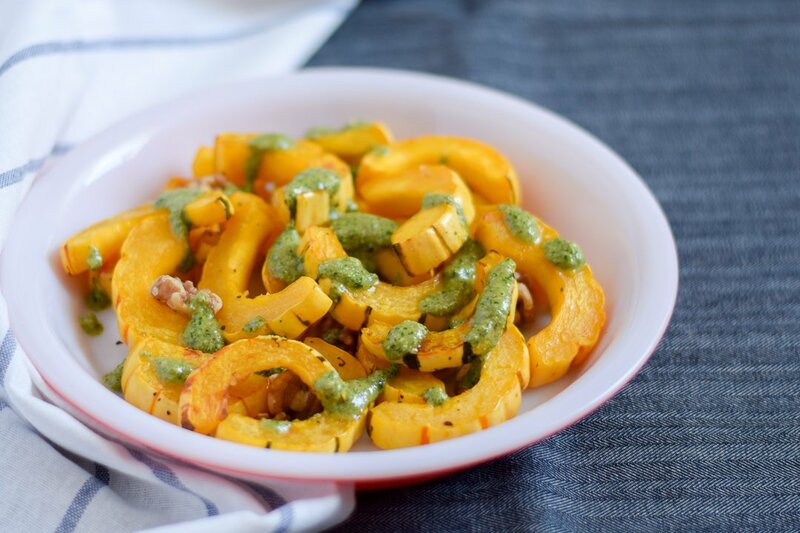 Arrange the squash and toasted walnuts on a platter or plate; drizzle the prepared pesto over the roasted squash. 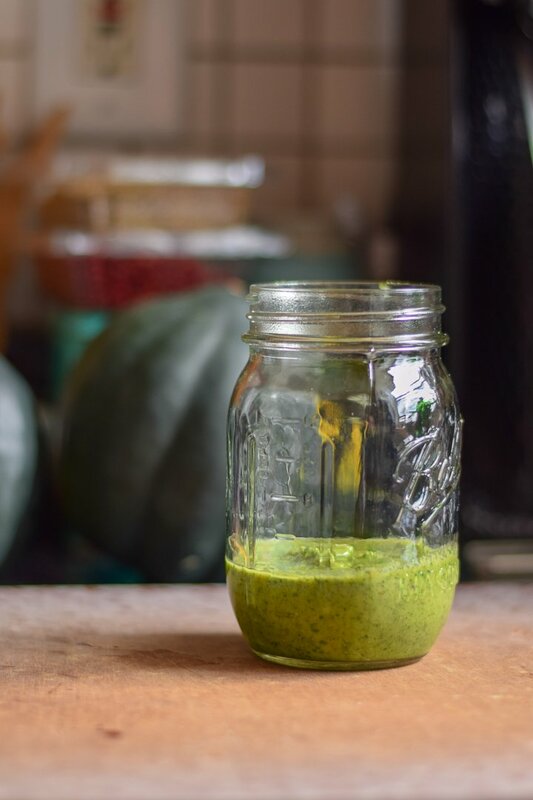 Serve any leftover pesto on the side. 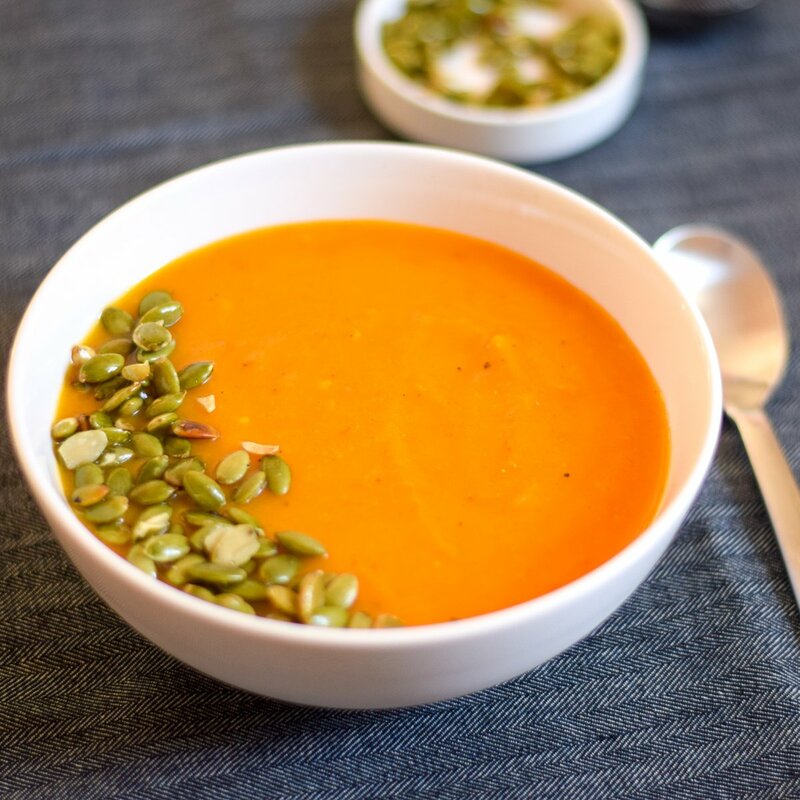 If you’re looking for more squash recipes, check out this Instant Pot Butternut Squash Soup! 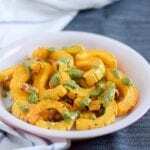 I’ve never cooked with delicata squash but I love that you added pesto. Sounds delicious and must be a great side for fall. I love roasting squash and pumpkin too. It becomes so sweet! Love the idea of pairing it with herb pesto. Can’t wait to try it! Going to pin it for later! I love the flavour that you get when roasting squash or pumpkin, this looks and sounds beautiful. It’s been ages since I had delicata squash – clearly that needs to change as I’m loving the sound of it with that pesto! 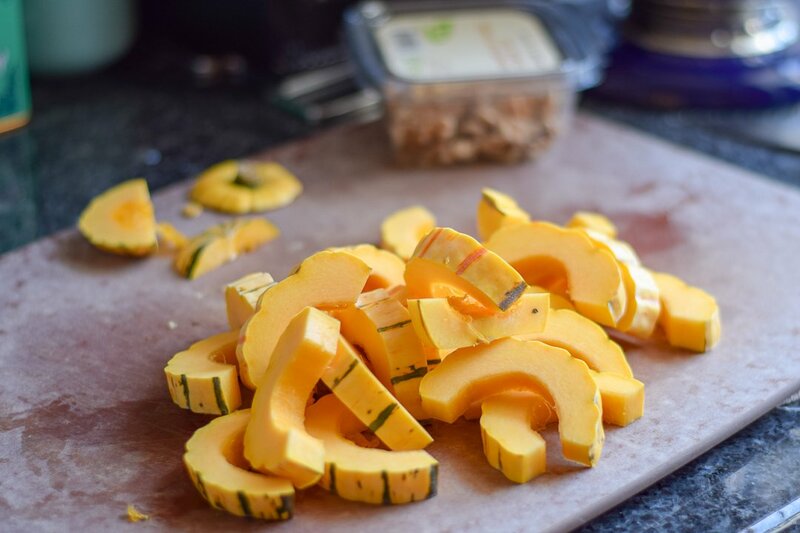 This looks like a side dish that I definitely need to try, I really love squash!